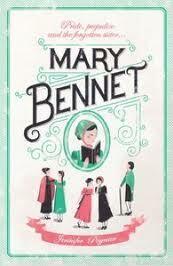 This is a gentle retelling of Pride and Prejudice as seen and told through the eyes of the third sister, Mary Bennet. To me, Mary is a classic ‘middle child’ in the shadow of her older, prettier sisters and overshadowed by her younger, fun, flirty and frivolous sisters. Mary comes across as being a sulky, uncooperative child but you do feel sorry for her, as you see and feel her loneliness and frustration. She is constantly teased and mocked by her father and sisters and hides herself away in her attic bedroom. Mary is quite a sickly child – some genuine but most in her mind and of her own doing – and is eventually sent to stay with a family friend. This becomes the turning point, where she starts to see life with a little less prejudice and a little bit more glee. As the story unfolds – and yes, we get to meet Wickham, Mr. Darcy, Mr. Bingley and one of my favourite Jane Austen characters, Mrs Bennet – we get to revisit scenes from ‘Pride and Prejudice’ from a different angle (Mary’s eyes) as well as find out what could possibly have happened to ‘the forgotten sister.’ Jennifer Paynter remains true to the original story (and style of writing) but makes it her own too in this lovely, evocative book. It is very ‘English’ but I enjoyed the link to Australia at the end too, but won’t share you with you how or why the book finishes in Australia – read it for yourself, whether or not you are a Bennet sisters fan or not! I am currently reading ‘Pride and Prejudice’ so when I noticed this on a blog browse I got pretty excited, definitely have to add it to my ‘to be read’ pile! I think its’ been released now too, so you should be able to find it quite easy. Isn’t the cover beautiful? ?